My interest in photography really became serious in the early 1980’s and this was fostered by membership of camera clubs in Harrogate and then Northallerton in North Yorkshire. However, my interest in natural history goes back a lot further, to schooldays in fact and as this intensified, the focus became predominantly ornithological. An involvement in bird ringing both in the UK and overseas, as well as in bird distribution surveys for various atlases has, over the years, provided a relaxing counterbalance to a busy professional life. Consequently, it was not surprising that as my photography developed, wildlife subjects were an early choice and they have remained firm favourites throughout my photographic journey. 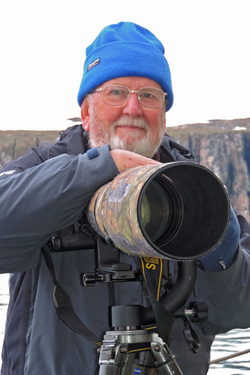 Over the years I have also enjoyed travel, which is the perfect partner for photography, and so now, with increased leisure time having retired to live in north Norfolk, I can further enjoy the pleasures of travel which in turn fuels my enthusiasm for both photography and wildlife watching.